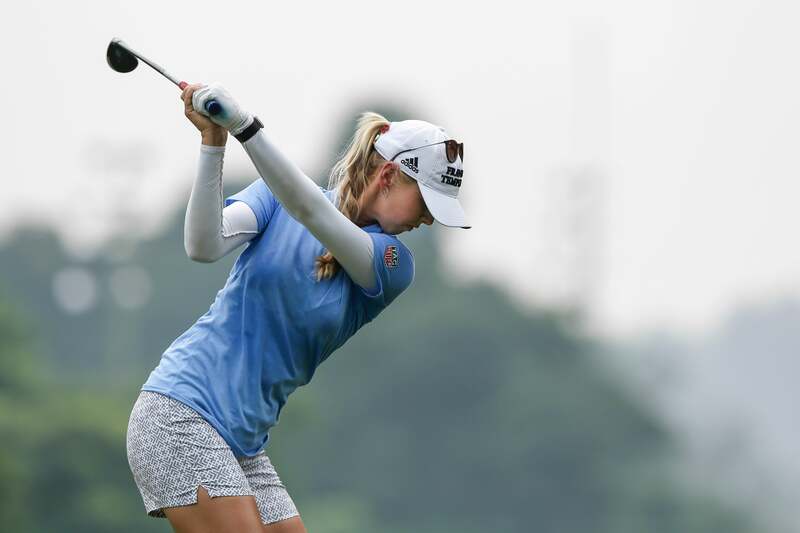 Use this tips from LPGA pro Jessica Korda to rip your driver by using your body's natural positioning. 1. Stand behind the ball and grip the club with your left hand only. It's simple: Just grab the handle without looking. This sets your left hand in its natural power position. Wrist angle varies from player to player—I like to keep my wrist slightly bent. 2. Depending on your anatomy, your left wrist will be either flat or flexed (like mine). What's important is that you maintain your left wrist position as you swing. Changing it disrupts your hitting instinct. Take note of the flex and accept it. 3. Put your right hand on the club and take your address, maintaining the position of your left wrist. Take a last look at the target and start back. Have no fear—you're one step away from catching the ball smack on the sweet spot! 4. As you swing to the top, hold the left-wrist angle you established when you first gripped the club with your left hand. Don't manipulate your left wrist or "flatten" it like many experts advise. Trust me: When it comes to big hits, your body knows best! Jessica Korda has notched four wins on the LPGA Tour.